Keeping to their original plan, the crew of Firefly left Fort Lauderdale for the Bahamas on New Year’s Day. “About 2 hours out, we started having motor problems. We were motor sailing to make better time, but we decided it might be better to turn around and go back to Fort Lauderdale. We were pretty disappointed about that,” Chris recalled. Chris took stock of the past 6 months as well as the future. 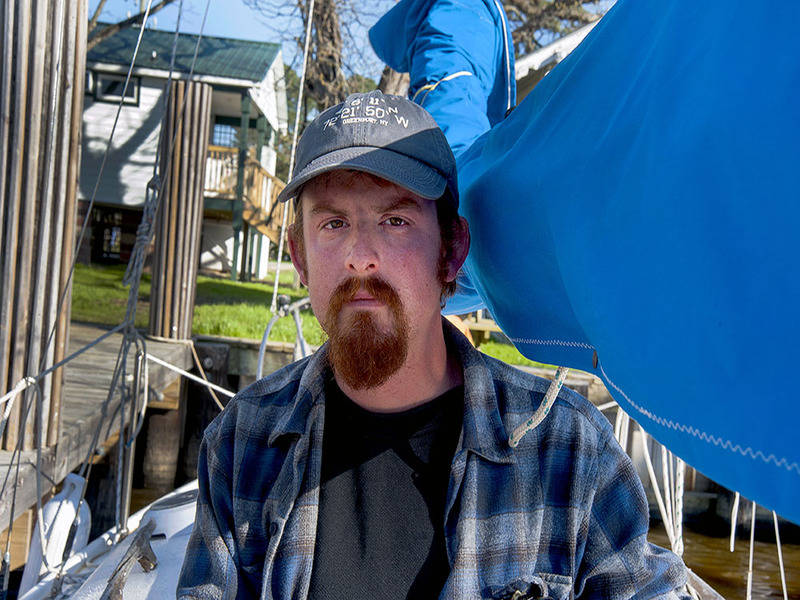 Until then, he will go back to nurturing oyster larvae through their metamorphosis into oysters for sale to commercial oyster farms. 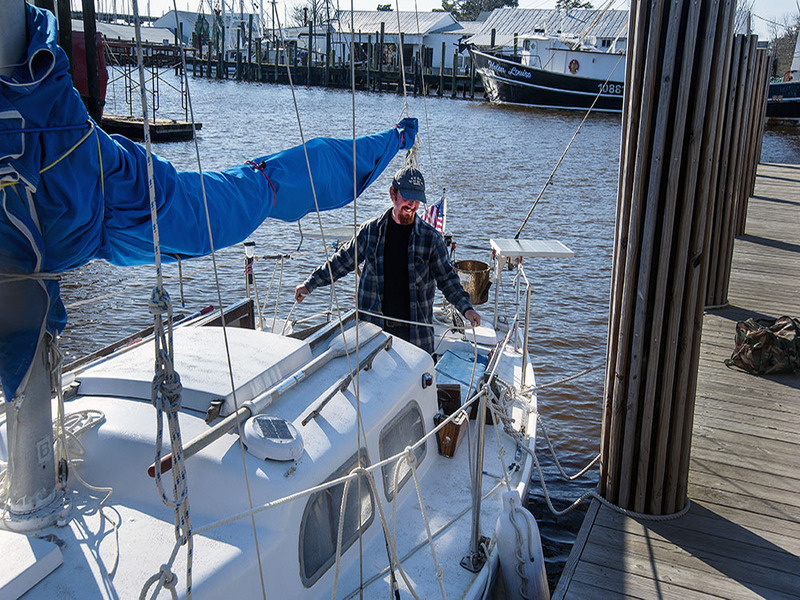 Chris spent part of Monday afternoon, March 21, preparing to take the long trip out into the Neuse, into the Goose Creek section of the canal, to the Pamlico River and Belhaven. Technology has invaded and aided their travels. When they started, they worked with paper charts. Now, they rely on apps on an i-Phone. 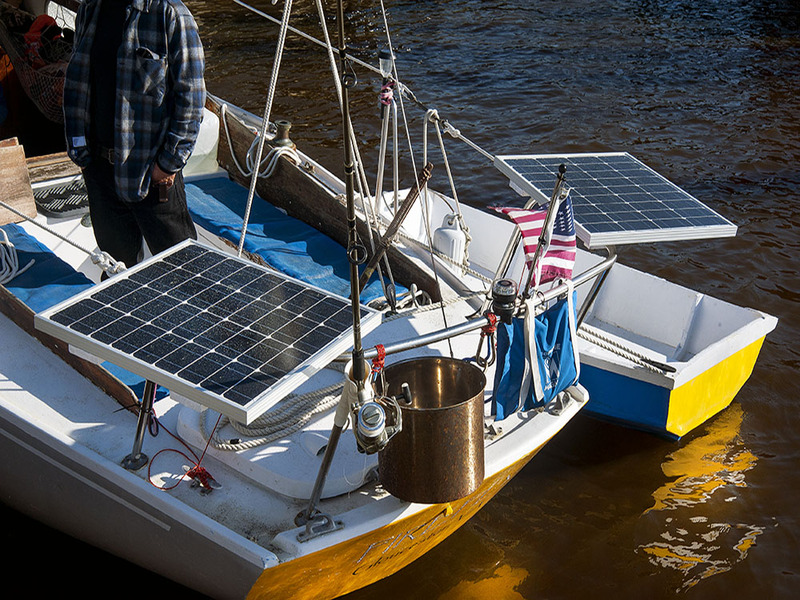 One use of technology was to install solar panels on Firefly capable of providing all necessary power without having to rely on an auxiliary generator. One can follow their journey on their website blog, www.thebonnieboat.wordpress.com. Following is their blog posted by Ryan which mentions the stop in Oriental and details the installation of solar power. When Chris and I decided to turn our little Firefly into a home, I immediately knew I wanted to take care of our power needs with solar energy. I worked for a biofuel company for a while a few years back (and learned a ton about green energy options), but didn’t truly become obsessed with solar until Chris and I watched the new version of Cosmos when it came out on Netflix (If you haven’t seen it, I highly recommend it). Neil Degrasse Tyson managed to make it abundantly clear to me: The sun throws energy at us constantly, and for free. It’s not going anywhere (or if it does, we’ll go with it). Solar energy is truly our greatest, cleanest, most abundant energy-related resource. As I write (from Oriental, NC… we stayed an extra day because the weather decided not to cooperate), Chris is working on wiring in an overhead dome light and another 12v socket. Sunny, wonderful day in Oriental. Even though we’ve really only had 3 sunny days so far on this trip (today is day 13), we’ve had more than enough power to keep everything running. We definitely over-estimated on solar panel size/battery need. And when the sun is shining, that’s when we charge the things that take up the most energy. When it’s not, we don’t. Another thing that’s happened on this trip is that the rhythm of our lives has started coinciding more with the rhythm of the sun, which, when you think about it, makes a lot of sense. We’ve gone to bed around 8PM and gotten up around 5AM lots of times. It just seems so natural to go to bed after it’s been dark for a while. And, we want to be under way while we have the light, and either at anchor or docked by the time it gets dark.